SWE Boston supported the Easton Middle School's Pathways to your Future Career fair to help middle schoolers learn about different careers and the paths they would need to take for those careers. Over 20 different educational organizations and corporations hosted stations for the 900 students that attended the event. 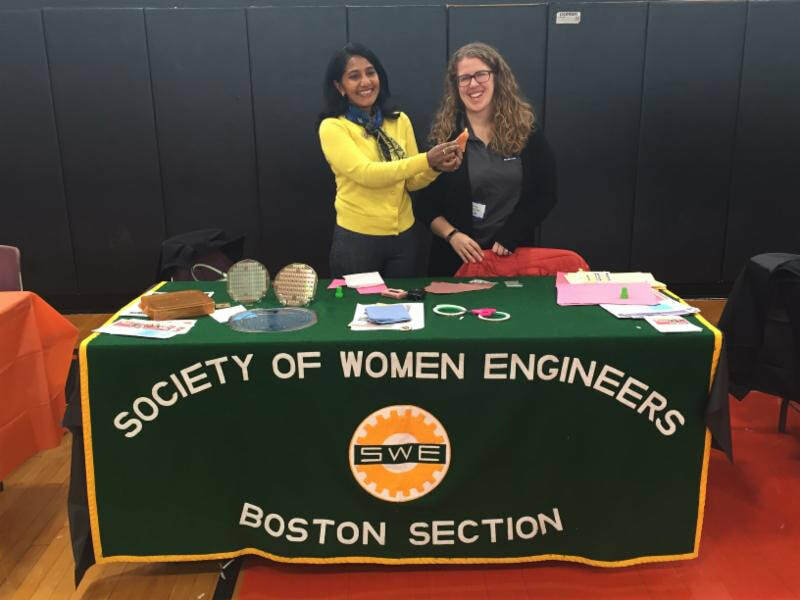 SWE Boston members Tulika Hainsworth and Ashley Sullivan had students build a simple version of a circuit, and also discussed how engineers shape our everyday world and the variety of engineering careers. Circuits are everywhere! Tulika had brought "show and tell" items that highlighted IC manufacturing and power of semiconductors in the electronics we use every day and Ashley had insulin pumps from her work as a biomedical engineer. It was a great opportunity to foster interest in engineering for these students and build partnerships with the teachers who are starting their very own high school SWE program! The Third Annual Pathways to Your Future event for middle school students will provide information to students about their choices, and help them connect educational pathways to future careers. This event will be an "expo" style event with many educational and career organizations represented at tables set up throughout the space. SWE Boston is in need of volunteers at our table to help ~900 middle school students learn more about engineering. We will help the kids make light-up greeting cards made from copper tape, batteries and LEDs, as well as answer any questions they have about our careers/education in engineering! Time: 8:15 a.m. to 11 a.m.
Email outreach@sweboston.org if you are interested or have any questions!